Freedom Mallows were first included in the #TVK2 box in the yummy flavour of Vanilla, this time you get Freedom Mallows in Strawberry £2.50!! They really make me feel as if I'm not missing anything. These tasted great in my strawberry milkshake this past weekend. Indulging in fat free, dairy free, egg free, nut free, GMO, Gluten Free, Gelatine Free - making these a vegan healthy alternative. Nothing but Red Pepper and Mangetout Snack £1.20, I'd thought I'd never heard of Mangetout before until I looked into what they are and realised they were the same flat peas I use to pick in the garden as a child for my mud pies! Nothing But Snacks are just as the name implies, it's just freeze dried vegetables with no additives or preservatives. 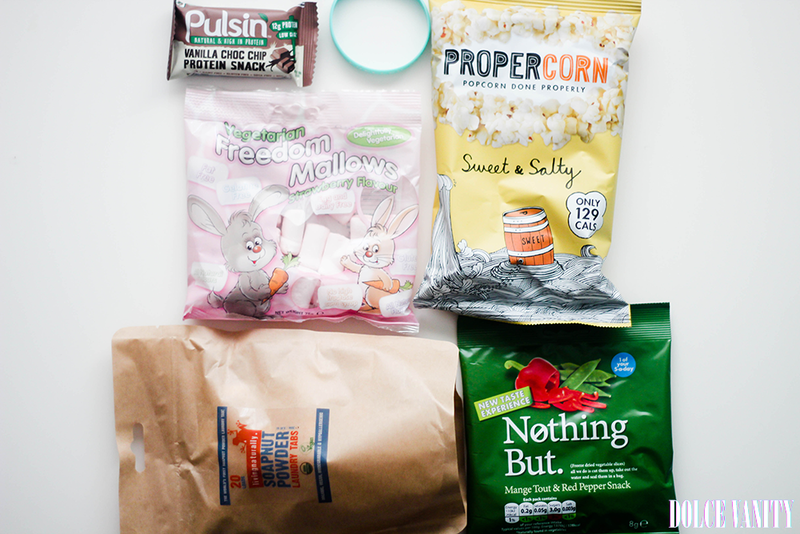 Propercorn Sweet and Salty Popcorn 80p me & Sweep both enjoy popcorn, I don't eat it as much as I use too. Probably a good thing too - addictive. These I'm sure I've seen in supermarkets(?) gluten & wheat free, their popcorn is gently hand-popped! Wonder how long that takes!? They take a little British rapeseed oil and secret seasoning & voila, Propercorn. Now I've found these a guilty pleasure, even with the calories not being so high, it makes me feel good ha! Had to check this had no raisins / sultanas in before stuffing my face with this Pulsin Vanilla Choc Chip Protein Bar £1.79. It doesn't BUT it does have nuts *nom* It's a small block of goodness fits into the middle of your palm and gone within a few munches. Yet so delicious and I decided to have this as my morning snack & sad it's gone.